I’ve been a big fan of David Fincher for a long time. I’ve seen most of his films and loved almost all that I’ve seen. This is not one of those loved pictures. After watching The Game without knowing who made it, imagine my surprise upon discovering that David Fincher, one of my favorite modern filmmakers, was the director. I was even more surprised after seeing the film listed on various blogs as considered one of Fincher’s best, because frankly I don’t see much artistic merit in the finished product. Michael Douglas gets pretty stressed out in The Game. Chill out, dude, it’s just a game. What I like about The Game is how Douglas’ character undergoes a substantial arc and he learns something of value by the end of the whole experience. The acting is decent by the whole cast, although frankly none of them are given much to do with the limited characters and vanilla screenplay. The major problems I have with this Fincher outing are (1) my general lack of interest in the vague characters, and (2) the script’s predictability and over-reliance on its twist ending (which itself is rather unsatisfying). It becomes obvious that the narrative will end one of two ways by the time the film reaches its half-hour mark, and this lack of mystery ruins most of the remaining suspense. Furthermore, the climax the film chooses feels decidedly safe, the easy way out, as if the writers were too scared to end the film on a downer note or couldn’t come up with a more nuanced explanation of what was going on. The story conjures an easy-fix solution that somehow attempts to explain all the unreasonable and unrealistic things that happen to its protagonist. The screenplay misses a big opportunity by not building on Douglas’ backstory, namely how he witnessed his father commit suicide when he was a young man. Based on the film’s prologue, I thought that event was going to be expanded upon and explored in detail. There is no intriguing, in-depth character analysis that results from this interesting character history. In fact, I felt many aspects of Douglas’ character were either hinted at or covered far too briefly. Much of Douglas’ protagonist feels skimmed over and his character attributes touched upon only in the most minimal fashion so that the plot can function. Douglas’ run-in with a creepy clown dummy is easily the most entertaining piece in the whole movie. All in all, I feel the film lacked any attributes that made it truly engaging. The screenplay is so lacking in depth, and Fincher does little to add much technical flair to the written material. Bare-bones plots have worked plenty of times in the past (e.g. Die Hard , The Raid ), but films like those are usually action films that rely on both elaborate, exciting action scenes and effective pacing. The Game has neither. I am and will continue to be a huge David Fincher fan. 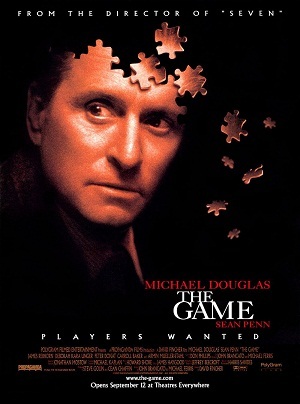 Like I said earlier, he is one of my favorite active directors and one of the best in the world at what he does; however, I don’t think 1997’s The Game is even close to a good example of his artistic potential. Check it out if you’re really interested, but otherwise, don’t bother. There are far better options available by this modern American auteur. SUMMARY & RECOMMENDATION: The Game’s story is far too emaciated to have much impact. Everything from the genre thrills to the characters feel bland. There’s nothing special to see here. The ending is unbelievable. — However… Michael Douglas is a decent protagonist, and both he and Sean Penn have semi-interesting chemistry.
? THE GAME. As far generic titles for generic movies go, this one’s rather fitting. You couldn’t have come up with anything else? Some things that occur in this movie, are a bit ridiculous, especially when you take into consideration the twist ending. However, the movie kept me spinning round and round, until I had no idea what to think, or what was really going on here underneath all of the crazy tricks. Good review. Thanks for the comment. I guess what hurt things for me is that I didn’t find the twist ending satisfying at all. To me, it’s sort of in the same vein as the “it was all a dream!” and “there really were never any monsters at all!” type climaxes. It did seem like that, however, I was so involved with everything that I almost didn’t care too much.